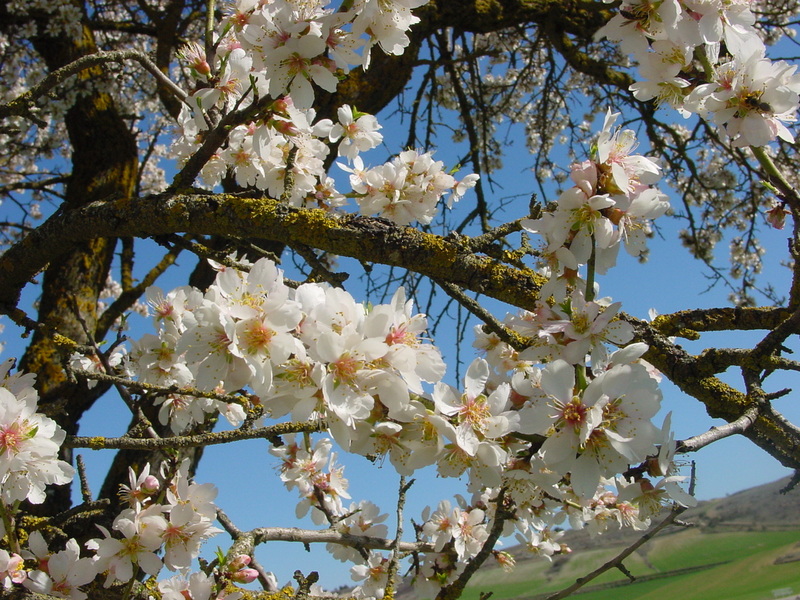 An almond tree in blossom near Urueña in Valladolid, Spain, during Tu BiShvat. Photo by Nicolás Pérez. Editor’s Note: The Jewish holiday Tu BiShvat, or New Year for Trees, is an ecologically-minded observance that began at sunset on February 10, 2017 and ended at nightfall on February 11th. David Krantz has allowed us to republish his article concerning this year’s celebrations, first published on Aytzim: Ecological Judaism. Traditionally, the New Year is a time for reflection and turning over a new leaf. Why should Tu B’Shvat, the New Year for Trees, a.k.a. the Jewish Earth Day, be any different? On Rosh Hashanah we think about who we’ve wronged, and we seek teshuva, which we often translate as repentance but literally means returning — i.e., to return to the state before one sinned. Perhaps, then, it is time for us to seek teshuva with the Earth. Perhaps it is time for us to turn to the Earth and return it to its former splendor. For all of human history until recently, we have been living in the Holocene Era — a time with climatic conditions that have enabled us to thrive as a species over much of the planet. But at some point after the Industrial Revolution began, we reached a tipping point. And it’s become ever-more apparent that we’ve passed that point. Welcome to the Anthropocene Era, a time when we humans have become the biggest drivers of change on Earth. We’ve leveled forests and mountains, covered the land in asphalt and concrete, largely removed fish from the sea and driven countless other species to extinction. Most famously, we have altered our atmospheric chemistry so drastically as to put our own future as a species at risk. And we’ve done all this damage to our planet without even trying. Largely, we didn’t mean to be so destructive; all of our negative impacts have been side affects. But that also can be a root of hope: Imagine what we could do if, as a human society, we decided to alter our planet for good. We’ve been inadvertently designing a warmer, less hospitable climate for more than a century now. What if we designed a habitable climate and a sustainable future? What would it look like? And how can Jewish tradition help guide the way? Recognize the problem and regret our actions. Society-wide, observers of American energy policy may note that this is the biggest obstacle to combatting climate change. How can we implement a solution if we don’t first recognize the problem? Individually, this also means recognizing our individual roles in the problem. While few of us have had a large say in environmental policy, to some extent — whether, for example, through our personal use of fossil fuels or through our voting for politicians who have refused to take significant action — we’ve all helped perpetuate the problem. Understanding the problem and our role in it is key to teshuva. Stop the harmful action. This, of course, is easier said than done, but I didn’t say that teshuva would be easy. And, particularly in the case of fossil-fuel consumption, it will be hard for us to stop without greater societal support. So call your elected representatives and tell them: Put a price on carbon by enacting a carbon tax or a cap-and-trade system, thereby discouraging the Earth-damaging burning of fossil fuels. Fund renewable-energy research and incentivize renewable-energy adoption. Ask for forgiveness. But how can you possibly ask the Earth for forgiveness? You can literally go outside and ask the Earth for forgiveness. But you also can ask for forgiveness from God for sullying God’s Creation, and for forgiveness from your fellow humans, because by damaging the Earth, our home, we’ve damaged ourselves. Choose better next time. Today is the 15th day of the Shvat, and tomorrow will be the 16th. Teshuva teaches us that it’s not enough to seek repentance, to seek a return, on the New Year, but we have to continue choosing more wisely daily. Every morning when we wake we have a new opportunity to get closer to God by being better stewards of God’s Creation. Every morning we have a new chance to design a better climate for ourselves and for all the other life that calls Earth home. This Tu B’Shvat, plant trees, but don’t stop there. Tu B’Shvat in the Anthropocene requires bigger actions. We need teshuva with the Earth.